It seems our To-Do list takes care of everything and everybody but ourselves, and that’s not healthy. Have you done something nice for yourself today? How about yesterday? During the past week? Too many of us could answer those questions with a resounding, “No.” It seems our To-Do list takes care of everything and everybody but ourselves, and that’s not healthy. We Americans love The Busy. We are Busy with our Job Work and Busy with our Home Work and Busy with our Family Work. “It must be done,” we tell ourselves. “It’s what responsible people do.” True. It is what responsible people do. But responsible people also make sure they are taking care of themselves so they can keep doing what matters for the people matter. So how do we responsible people keep it all in balance? Too much on the To-Do list – tasks that aren’t truly necessary – can keep us from caring for ourselves as well as we care for others. It can keep us from taking a few moments to unwind, to practice yoga, to read, to visit with a friend, to enjoy a bit of quiet meditation, to treat ourselves to a much-needed massage… We’re tempted to think we can endlessly continue to put pedal to metal and our wheels will keep turning even when the tank is on Empty. But a car won’t run that way. And neither will our bodies, minds, or spirits. So if you have fallen out of the habit of caring for yourself and making sure you get the mental, spiritual, and physical food you need, I’ve snooped around and found some suggestions on how to start filling your own tank. You know, so you don’t accidentally drive everyone off the cliff. 2. 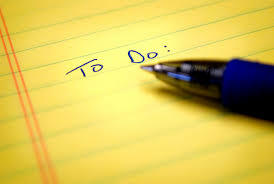 Scrutinize your To-Do List to see if any tasks can be removed without a truly negative outcome. 3. Delegate. Where possible, think less hand holding and more responsibility and accountability for those in your care. A 12-month-old can’t change his own diaper, but a 15-year-old can certainly pack his own lunch. You need not do everything for everyone. 4. Lower your standards here and there. If you winced at that one, chances are you could benefit from practicing it. The floor doesn’t have to sparkle like Waterford crystal. The kids can load the dishwasher differently than you do. Your spouse can tackle the grocery aisles. 5. See rote tasks as an opportunity to meditate. Allow yourself to become completely absorbed in folding that stack of towels. Instead of letting your mind wander (or complain), see the colors, feel the textures, notice the patterns. 6. Learn to say NO to offers that don’t fit into your schedule or into what you value. Practice saying no: stand in front of the mirror, smile, shake your head softly, and say, “No, I’m sorry – I already have plans.” It’s a true statement. You’ve made plans that include caring for yourself! After a couple of weeks of including you on the To-Do list, notice of how you feel. Happier? More at peace? More patient? More rested? Awesome! You just might inspire your family, friends, and co-workers to be nicer to themselves. If taking a yoga class is on your To-Do List (and we certainly hope it is), join us on the mat soon!